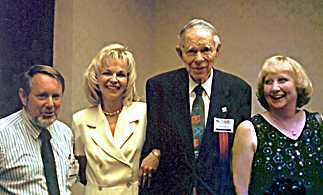 Seaborg was born in the mining town of Ishpeming, Michigan to Swedish-American parents. They moved to California where Glenn worked his way through UCLA as a stevedore, picking apricots, as a linotype apprentice, and finally as a lab assistant. He earned a Ph.D. in 1937 working with G.N. Lewis at the University of California-Berkeley. He followed Edwin McMillan´s previous work to use Ernest Lawrence´s cyclotron to produce and rapidly discover Plutonium. McMillan and Seaborg shared the 1951 Nobel Chemistry Prize for this and the subsequent discovery of Neptunium. During World War II Seaborg was responsible for working out the chemical process for separating Plutonium produced from the nuclear reactors designed by Enrico Fermi and cooled by the Columbia River in Washington State. The top secret project was based on the discovery by Lise Meitner that Uranium struck with neutrons could fission and release energy. Niels Bohr had carried this news to the United States where Albert Einstein wrote a letter convincing President Roosevelt that a powerful bomb might be possible using the energy from the missing mass in a fission reaction. Fermi, having fled Italy, assembled piles of graphite containing Uranium to measure if a chain reaction fission was possible. Fermi found a way to coax Uranium (99% isotope 238) to slowly fission with a half life of several years instead of releasing alpha radiation over billions of years. Two types of fission bombs might be possible but each required a number of untried procedures. A sufficient quantity of purified isotope Uranium-235 might fuel a rapid fission bomb. But Uranium was one of the rarest elements. Uranium-235 was only 0.72% of elemental Uranium. Making a bomb would require that a method be found to separate pounds of Uranium-235 from the accompanying chemically identical Uranium-238. The second type of bomb would employ slowed neutrons released by Fermi´s slow fission of Uranium-238 in a graphite reactor to create Plutonium. 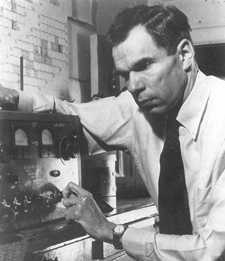 Seaborg was asked to devise remotely controlled chemical procedures to extract the Plutonium from other highly radioactive reactor products. Pure Plutonium, like Uranium-235, might fuel a rapid fission bomb. A remote laboratory in Oak Ridge, Tennessee, succeeded in using one of three attempted methods to separate Uranium-235. And the Fermi/Seaborg production facilities at equally remote Hanford, Washington, also succeeded to produce Plutonium. Bombs were made from both materials, and they resulted in the surrender of Japan, ending the war. After the War the University of California Radiation Laboratory at Berkeley grew under Seaborg's direction as they renewed efforts to make atoms heavier than any previously known. Teams prepared Americium, Curium, Berkelium, Californium, Einsteinium, Fermium, Mendelevium, and Seaborgium as well as some of the latest unnamed additions. In 1958 Seaborg became the Chancellor of the entire Berkeley campus. While in that capacity, the American Chemical Society asked Seaborg to chair a group to radically improve high school chemistry instruction in the United States. Changes created by his CHEM Study team still pervade chemistry instruction today. In 1960 he was appointed chair of the U.S. Atomic Energy Commission (now Department of Energy). After that role, Seaborg returned to direct the Lawrence Hall of Science on the Berkeley campus, to champion improved science education, and to continue to help in the production of new elements. In June 1974, members of the Joint Institute for Nuclear Research in Dubna, U.S.S.R., reported their discovery of element #106. 280 MeV ions of 24Cr54 from the 310 cm cyclotron were used to strike targets of 82Pb206, 82Pb207, and 82Pb208, in separate runs. Foils exposed to a rotating target disc were used to detect spontaneous fission activities, the foils were etched and examined microscopically to detect the number of fission tracks and the half-life of the fission activity. Other experiments were made try to confirm the discovery. Because of the uncertainty of the parent elements of spontaneous fission, not everyone regarded the synthesis of element #106 certain. 98Cf249 + 8O18 ⇒ 106X263 + 4 0n1 which decayed by α emission to Rutherfordium, and then by α emission to Nobelium, which in turn further decayed by α. Element 106 had α energies of 9.06 and 9.25 MeV with a half-life of 0.9 ±0.2 s. Neither the Dubna team nor the Berkeley-Livermore Group proposed a name for element #106 at the time but the temporary name of unnilhexium was assigned. After element #106 was confirmed by additional experiment using LBL's 88-Inch Cyclotron in 1993, Kenneth Hulet, retired chemist from LLNL and one of the co-discoverers, while accepting the American Chemical Society award for Nuclear Chemistry in March 1994 proposed the name of Seaborgium and symbol Sg for element #106. There was three years of debate including disagreements on priority for discovery of several elements and whether it appropriate to name a chemical element for a still living chemist. Finally in August 1997 the International Union of Pure and Applied Chemistry (IUPAC) voted 64 to 5 to adopted the following official names: #104 = Rutherfordium, #105 = Dubnium, #106 = Seaborgium, #107 = Bohrium, #108 = Hassium, and #109 = Meitnerium, IUPAC also recommended that elements #101 (Mendelevium), #102 (Nobelium) and #103 (Lawrencium) should retain their commonly accepted names.